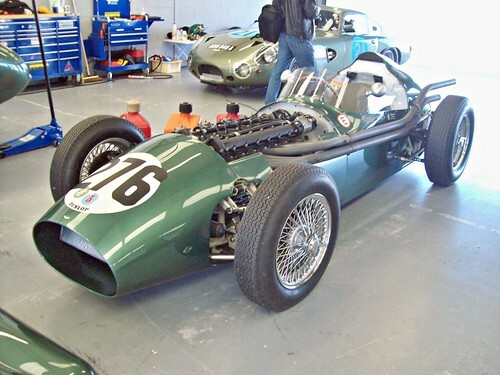 Designed by Ted Cutting, and originally built abd tested in 1957, the DBR4 was intended to give Aston Martin the success in Formula 1 that they were enjoying in Sports Car racing. The chassis of the DBR4 was a conventional spaceframe structure, skinned with aluminium bodywork. Beneath the skin the DBR4’s basic design was closely related to the DB3S sports car of 1956, but with its ancillary components more tightly packaged to enclose them in the smaller, single-seater body. Although some manufacturers had started to use wind-tunnel testing for racing cars, such as the Bristol 450, aerodynamics as a science was still in its infancy where road vehicles were concerned. As a result of this, although the DBR4’s bodywork appeared svelte and streamlined, the effect was ruined by the decision to mount a large air intake on the side of the bonnet, and to install a relatively tall, near-vertical windscreen. Although the prototype was running in 1957, developement was put on hold. Towards the end of 1958, Aston boss John Wyer instructed Ted to get the GP car out from under its sheet and redesign the front suspension for the 1959 season. That was completed in six weeks and a second car, DBR4/2, was built to the same design. The Aston Martin DBR4/250 was unveiled to the public in April 1959, and made its competition debut on 2 May in the non-Championship BRDC International Trophy race at Silverstone. Both cars performed well, but the truth was what would have been a good car in 1957 was now to heavy and oudated, against newer designs and in the face of the rear engine revolution. At the DBR4’s World Championship debut in the 1959 Dutch Grand Prix on 31 May, Shelby and Salvadori could only manage 10th and 13th fastest in qualification, respectively. During the race both cars succumbed to engine problems in the early laps and failed to finish. Further delays and shifted priorities meant that the light green Astons only appeared at a further three races of the 1959 Formula One season. The DBR4s failed to score even a single point during this time; their best results being a pair of 6th places for Salvadori, taken at the British and Portuguese rounds. Following a second disappointing outing in the BRDC International Trophy (Trintignant was tenth and Salvadori’s engine expired on lap 4), a solitary DBR4 appeared in practice for the 1960 Dutch Grand Prix, entered for Salvadori when the DBR5 was not ready. But Aston withdrew the entries following a dispute over start money. Aston Martin soon abandoned F1. Three of the DBR4s were converted to ‘300’ specification, with 3-litre engines for Australian owners racing to their local rules. Lex Davison had DBR4/1 first and then DBR4/4, While DBR4/2 was cut up by the works and number 3 was sold to another Australian, Bib Stillwell. The factory converted it into DBR4-300/3 and it was raced it in that form, still with its Maserati gearbox.